Property Details: 2 Bedroom, 2 Bathroom beachfront condo with approx. 1,160 square feet. Gulf Shores condo for sale at the Lighthouse. Exceptional real estate investment opportunity at one of the Alabama Gulf Coast most highly sought-after communities. This beautiful beachfront 2 bedroom condominium home is perfectly located on the 7th floor & has a fantastic rental history. Some items do not convey, but otherwise this resort residence comes completely fully furnished. Lighthouse condos in Gulf Shores, a beachfront community on the Gulf Coast, are among the first condos you see when arriving on the island - this popular resort offers convenience plus 635' of beachfront, with 251 residences consisting of one, two and three bedroom residences. 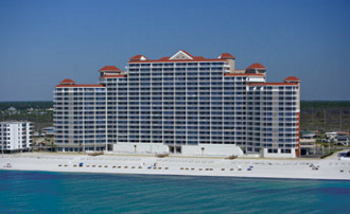 Gulf Shores sub-tropical weather allows for an array of outdoor activities year-round.